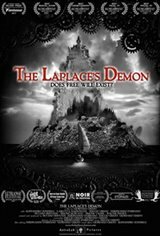 The mathematical theory of the Laplace demon supposes that if someone knows the precise location and momentum of every atom in the universe, they could predict everything down to the smallest detail. Thus prepared, welcome to this visually thrilling chiaroscuro mind-meld of Agatha Christie, Rod Serling and Mario Bava-style Italo-noir. A group of scientists who believe they have cracked the code are invited to the mysterious island home of reclusive Professor Cornelius. Introducing himself via videotape, he tells them they are now literal pawns in a twisted experiment causing them to disappear one by one unless they work it out.